Today is September 9th, or 9/9/9! Also Kiku no Sekku as it is known in Japan. Kiku no Sekku is Chrysanthemum Day! The Chrysanthemum is the national flower of Japan. When I lived in Takefu, there was a beautiful Chrysanthemum park not too far away. 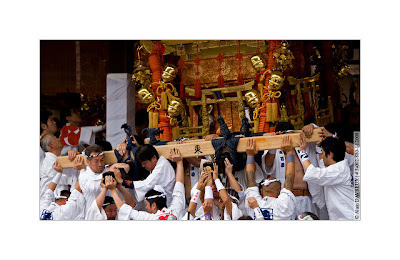 ANYway, Maurice and I helped carry around a Mikoshi (a portable Shinto shrine). Well... carry isn't the right term, because part of the job is hoisting it up the the air and screaming. I couldn't understand the chant, so I don't recall what it was. The guy behind me wasn't really lifting the shrine at all (did I mention it's big and metal and HEAVY? ), and I ended up hurting my shoulder (and tearing the uniform they had me wearing) and had to drop out. Lame! If I still had my pictures, there's one where it's CLEAR that the guy behind me is not carrying his weight. Darn it!